The tragedy in West Virginia this week, with the loss of 29 miners, emphasized the dangers that can arise in the production of fossil fuels. While the United States mines are, in general, much safer than those of many countries around the world, any death is a loss, and so I thought I would write a short series of posts on coal mining, from its origins to the methods of mining that are used today. Hopefully, as the series progresses, you might get a better understanding of the world in which the modern miner works. I will throw in a little history, since it helps to explain the evolution of some techniques. I intend to cover some of the other uses of coal, beyond power plants. The coal at the Upper Big Branch Mine, for example, is a metallurgical grade coal, used in steel manufacture. The loss of production from the mine is already having an impact in that market. So, to begin, I am going to chat a bit about the origins of coal, where it came from, and some of the limits on estimating how much there is, and how much we are going to get out of the ground. On the occasional morning each week I exercise and watch a video to help pass the time. About a year ago I watched the Cosmos series with Carl Sagan. If you get to about 9 minutes into the 10th episode he talks about how the Sun and planets rotate about the galactic center (the middle of the Milky Way) at somewhere around 220 km/sec. (The actual number has recently been increased about 15% to around 568,000 mph). Bear in mind, however, that speed is generally considered relative to something else and so different numbers can be found. This means that it takes about 250 million years (according to Sagan) for the Sun to circle the center, and as it passes around the center it will move through the four major arms of the galactic structure. And as it moves through these different zones, so there are different conditions that the Earth and the Solar System encounter and these changes reflect on the conditions that helped form the rocks that are now beneath our feet. Geologists have been able to divide the history of the Earth into different epochs, with changing conditions leading to different types of rock being deposited, depending on what the surface conditions were at the time. In those different epochs temperatures varied, with the following plot coming from the Paleomap project. Basic divisions and temperatures of the geological intervals in the Earth's rock history. 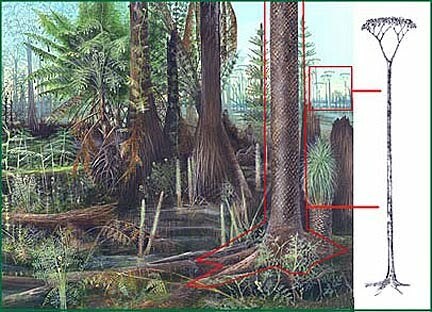 The period that I want to talk about today is known as the Carboniferous. It was some 300 million years ago, and so a bit more than one revolution of the Sun around the Galaxy. Back in those days, about 30 million years before the time of the dinosaurs (which appeared about that 250 million year ago time when the Sun and us were in about the same relative place as we are now) the landmass of the planet was much different than it is now, and Continental Drift had not yet got the continents to their current position. The late Bob Stefanko has written that the Great Dismal Swamp is probably the best current place that represents the type of conditions under which, back in Carboniferous times (about 355 to 290 million years ago) the various vegetative fragments fall into the water, and are slowly compressing to form a layer of peat. The peat layer in the swamp is about 7 ft thick, which may ultimately compress and ultimately convert to about 20 inches of coal. The swamp is slowly sinking, allowing the vegetative mat to continue to deepen and slowly built to a greater thickness. The trees, however, back then did not look quite the same as today. Illustration of a living tree, parts of which were found as a fossil. Back in the Carboniferous Bob Stephanko noted that the speed at which the layers formed was likely about twice that at which the current Swamp is growing, and that, due to the different levels of pressure required to form them, it would have taken about 160 years to lay down what is now a 1 ft thick layer of lignite; 260 years for a foot of bituminous, and about 490 years for a foot of anthracite. Since it is more worthwhile to mine thicker coal, and eight-feet is a nice working height, this would have required about 2,100 years of steady growth to lay down the layer of vegetation that formed the Pittsburgh seam in Pennsylvania. 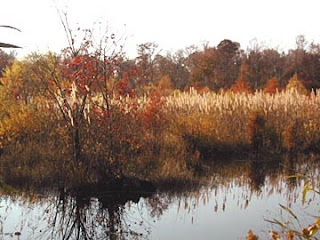 The original areas over which these forests and swamps grew were vast, and the cycles of deposition grew as the land distorted, with multiple seams being deposited in some cases, and a single thick seam in others. But how has it survived? How much is really there, and how much can we actually produce? I thought I would split those questions into several bits, and in this one, I’d try and explain some of the reasons why, while oil companies often get more oil out of the ground than they anticipate, it is often the other way out when you are mining for coal. So, consider, if you will, the map from the site above, that shows back in Serpukhovian times that the planet looked a lot different than it does now. 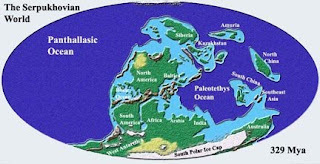 Shape of the world at the time that the coal seams were laid down. With all the continents together, as they were, they have had to travel a considerable distance over the past 300-odd million years to get to where they are today. Along the way they have bumped into each other, and in the process caused mountain ranges to rise, and fall, and there has been quite considerable erosion of the surface between times. And when the land fell then the seas would deposit more layers of rock, so that the coal as it was formed by the pressure of the rocks that overlay it, and the increase in temperatures that the coal would encounter as it moved deeper into the earth. These would change the original peat into the different types of coal that we know today. These start with a brown coal, or lignite. This is mined today in Texas, among many other places, and the transformation is not yet totally complete. With increasing pressure, heat and time, the brown coal (which often has a very high moisture content) is transformed into a sub-bituminous coal. This may have between 42 and 52% carbon and 19 to 26 magajoules of energy per pound. That in turn, if the conditions exist, will transform into a denser, harder coal that is the most commonly found around the world, bituminous coal. And if the pressure continues, then the highest quality coal, anthracite – at 86-97% carbon may be formed. This latter is relatively rare in coal fields, being less than 0.5% of the coal in the United States, for example. Even though the original coal material was laid down horizontally, as the continents moved these rocks became folded and tilted. Thus, for example, in Washington State beds, and in Colorado coal seams may end up lying at very steep angles. The geological way of expressing this is to talk about the dip of the seam, that being the maximum angle to the horizontal, while the strike of the seam is the line along the horizontal perpendicular to the dip. Thus beds in Washington State may dip at between 20 and 60 degrees. Vertical slice through an area of Washington State showing the way that the coal seams dip. During the communist era , this region produced most of the Soviet Union's coal, and reaped the high wages and prestige that came with it. Statues of miners were erected in squares; villages were named after famous engineers. The tide began to turn in the last 20 years of Soviet rule, when the flow of funds from Moscow dried up. After communism's fall, the mines were exposed as the money-losers they are, at the same time that economic pressures devastated their customers. In a decade, the demand for Ukrainian coal dropped 45 percent. Now Donbass is clinging to the two-thirds of its industry that remains. Viktor Yanukovich, the regional governor, said in an interview last month that another 30 of the region's 89 mines would eventually have to close. But he said he needed at least five years to accomplish that and needed an average of $18 million per mine to provide the miners benefits, retrain them and safely close the pits. "I am not against closing down the mines," he said. "But not as it was done before." Talk of closure is anathema to Anatoli Goncharov, the director of Gaegova mine, which is located in a bleak village outside Donetsk. His mine produces 360,000 tons of coal per year, less than half what it did in the mid-1980s. Because of the steep angle of the seam, half of coal must be extracted by hand, with hammers. It costs the mine nearly $30 to produce a ton of coal -- $11.50 more than the coal is selling for. Even with $2.7 million in state subsidies last year, the mine failed to break even. The Ministry of Fuel and Energy has put it on a list of pits that cannot be saved, the mine director acknowledged. (Note that the story is from 2002). At the time the region was being considered as a future source for coal bed methane. There is, for example, a prospectus as part of the methane to markets program. Coal seams can be mined as deep as 4,500 ft, but the methane and other problems (including keeping the roof from falling in) have made these difficult conditions to work in, so that while there is still coal in the ground, it is becoming increasingly uneconomic, under present conditions, to extract it. So one of the first problems that the mining engineer has in determining whether to count coal as a reserve is whether or not it is either practical or economic to mine it. This means that, in general, it must be machine mineable, since the productivity of a human miner is no longer sufficient, in many countries, to cover the costs of labor and support. The second problem is to ensure that there is enough of it. And so before deciding to mine the company will drill cores down to the coal seam over the planned area that will be mined. These don’t, at first sight, need to be that close, since the initial intent is just to see what is there and that it goes out far enough to make it worth while to sink the mining shaft (which costs several million dollars). However, even the best attempts at accuracy with this planning do not necessarily work out. Consider for example, the case of the mine at Glenrothes in Scotland. The primary reason for the designation of Glenrothes was to house miners who where to work at a new super coal mine. This was to be the most modern of the day and was built west of Thornton, an established village south of Glenrothes. The Super Pit was named the Rothes Colliery and it was officially opened by the Queen in 1957. Iconic photographs of the young Queen going down the Rothes Colliery in an all-white boiler suit and helmet are still regularly shown in programmes about the royal family. About 5,000 miners were to be required to produce 5,000 tonnes of coal per day, and huge railway yards were established. The pit was to have a working life of 100 years. The planned long-term benefits were to be huge, and the driver for economic regeneration for central Fife. In 1961, 4 years after opening, the huge investment was written off and the mine run down because of un-stemmable flooding. There were actually a couple of problems at the mine that could not easily have been foreseen by the drilling pattern. If you look back up at the picture of the Washington coal seams you will see the almost vertical line in the middle of the picture, with the black lines representing the coal seams vertically offset one from the other on either side of it. This is what is called a “fault”, and over the course of time the rock was moved to the point that it broke here and created this fracture in the ground. The rock then moved on one side relative to the other. (Like, on a very small scale, the movement that occurs across a major Earth fault when there is an earthquake). 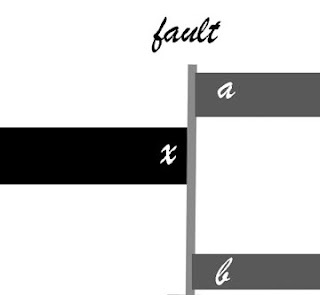 You have mined to x and meet a fault, did the coal go to a or b? How do you know? With the movement the rock that lies along the fault gets crushed, which can make it easier for water to flow through. So that if some of the rock, on either side of the coal seam, contained water, then when the mining operation reached to fault, then water could flow through the fault into the mine. There is also another problem. Say you are in charge of the driving of the tunnel that reaches the fault. Suddenly, in front of you, the coal turns into rock. You realize that you have hit a fault, but which way did the coal go – did the ground hade (move) down, or up. The rational way to find out is to drill up or down until you find where it went. Well that takes time, and money, but the worst isn’t over yet. Now you have to move the mining operation that say 20 ft that the coal has moved up. This means driving tunnels upwards, then moving the equipment up, and then recreating the mining pattern, and then moving on. All this development has been in rock, so you haven’t been earning any money from the area while this was going on. And if the difference in height is too great, then the area is abandoned for the time being. There are a couple of other problems that happened at Genrothes that are also fairly common, but that can make life miserable for the miner. Let us go back to when the coal was first still vegetation in the swamp. Swamps are not great flat growing areas that are all even. Streams work their way through, cutting channels through the peat and filling them, often with sand, or other material washed down from local hills. There are dirt hillocks and, after storms the land might be flooded with layers of silt, that can be feet thick. Now move forward some 300 million years. The sand and silt have turned into sandstone and shale, but they did not compress as much as the vegetation. So now instead of there being a nice 8-ft thick seam which the miner has a machine to extract, the coal has a layer of rock in the middle (the silt layer) that is about a foot thick, but that wanders up and down in the seam, and then gets thicker, as it approaches an old river channel so that the two sections of the seam are now about four feet apart. The mining machine grinds off the coal with picks but when these start to run into rock they wear away very quickly, so that mining slows down and becomes more expensive. And then the machine reaches the sandstone filled river channel and things get just a little more difficult. When two fours are not as good as one eight. Now the coal is still there, there are a lot of tools to help get it mined that were not around at the time of Glenrothes, and it is not really necessary in all cases that miners be physically present at the machine when it is mining. But some of the time we still haven’t got the answers that would bring some of this coal back to the point where it is considered a reserve. And there is some doubt, therefore, as to what we call a reserve and what not. But we’ll leave that discussion to another day. Interesting post Dave, looking forward for the following chapters.